Happy holidays from Lauren with The Semi-Designed Life! I'm here with a snuggly Anatomy of a Home. We're talking about the cave of the casa. 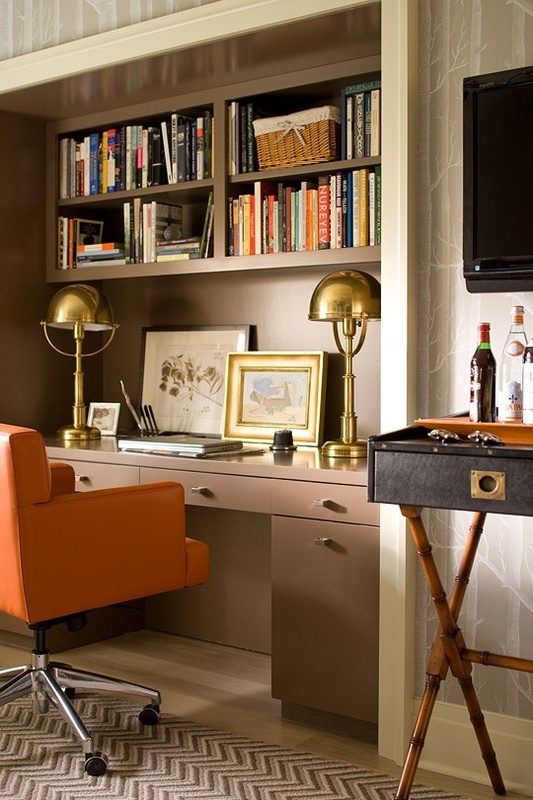 In my eyes, the study needs to be a dark, lush corner that oozes a bit of man-ness. This study is super mantastic. But, the gentleman of the house was all like, "hey, lady friend. I made you a zebra chair for you to sit in. So, please, join me." Except that you can totally tell that the man gets the seriously cozy spot. At least he's accommodating the ladies. Anatomy Lesson #1: Your study needs legit seating. For all the ladies and the man friends. If you can swing it, upholster the coziest spot in a super lady fabric so you're certain your spot will never be stolen. This study makes me a happy camper. This is how real humans live. Perfectly imperfect in so many ways. So often are bookshelves statically styled (I'm victim to this) that you never actually read your books. This room is lived in and loved. Anatomy Lesson #2: Live like a real human. The study is one room where the misplaced looks perfectly placed. Well, hello buffalo check! 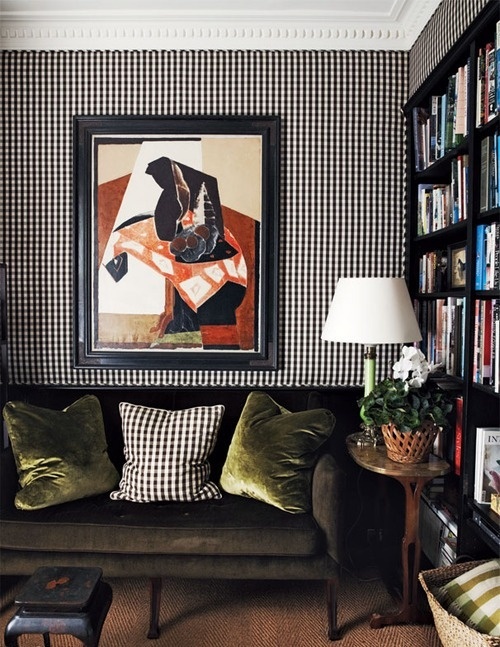 This small classic print gets a punch of happy by finding it's way on the walls. Plus I feel like a man could stand in front of it and be camouflaged. Manouflaged, if you will. Sassy. Anatomy Lesson #3: Be bold with your man fabrics. Then take a step back and say, "whoa, I need a bit of velvet in my life." This Hermes-y nugget is a super efficient use of space. And look at that faux bois wallpaper. It's like you're working in the woods. Besides feeling like you're camping in this room, it offers one clutch amenity: Booze. Anatomy Lesson #4: You really can't get more manly than a study bar. Just can't. End of story. "hey, hey lady friend!" I think I've heard that line a time or two, but never in such a chic setting! Love them all and I think I'd happily make myself comfortable in any of these man-scaped rooms. "hey, hey man friend...will you get me a martini?" Oh I love all of them but the first one is the best,always so great to have one room in the house that you can paint dark and make it intimate man cave or not! Love a good study! Thx for inspiration!